I went to Bonaire for two weeks, scuba diving and snorkeling. I wanted to take some radio gear. And so I did… about 50 pounds worth! I went on a road trip with my friends Tim Kreth (AD4CJ) and Doug Miller (W4DML) last weekend to work portable from a beautiful scenic overlook. We drove about 70 miles, full of anticipation, only to find that the scenic overlook had been closed due to a hunting event! We needed to make lemonade out of lemons. Running out of time, we decided to head toward home and stop along the interstate at the first exit that looked promising. We found a field that was on an elevated exit of the interstate. It was getting late in the afternoon and we only had a short time to set up, make some contacts, tear down, and begin the drive back home. I had planned to shoot some video footage for the blog but I only worked a few stations before having to tear down. 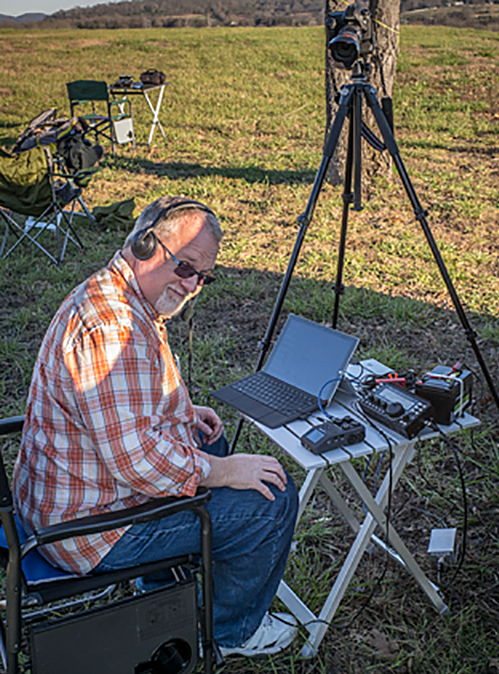 I spent a lot of time trying to scare up some DX on 15m with no success. I did work Cuba on 15m and a couple of other stations on 20m. Tim concentrated on working 20m and had a lot of fun contacting stations participating in the Skywarn Appreciation Day event. Doug used the time to deploy and trim up a homebrew fan dipole that he’d built. You can see my setup in the photo, below. You’ll see Tim’s setup in the distance. Is there any better way to spend a Saturday afternoon than going somewhere with friends to play ham radio? My friend Andrew (AK4FA) asked me whether the vertical antenna I blogged about yesterday could be blown over in the wind.